“Can I have one?” asked Builder Guy and Top Gun as I took the roasted asparagus out of the oven. I handed a spear to each of them, and they noshed on it while I plated the asparagus and drizzled the orange ginger glaze on top. Roasting is one of my favorite ways to cook vegetables, and I enjoy the fresh flavor a fruity glaze adds. I’ll take a light glaze such as this over a heavy cream sauce any day. This recipe makes a family-sized amount, but you can cut it in half for a smaller group. 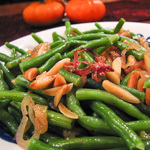 You can also make this with green beans, if you prefer. Always taste the marmalade first to judge the sweetness. If it’s really sweet you can omit the honey. I created this recipe using real orange marmalade made from Seville oranges (bitter oranges), so look for that in the jams and jellies section at your grocery store, or better yet, make your own orange marmalade if you have access to bitter oranges. 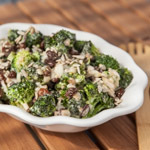 This recipe can be made gluten-free if you use a gluten-free soy sauce, such as San-J. Preheat the oven to 450° F/230° C.
While the oven heats, warm 2 tablespoons of olive oil in the small pan over medium heat. Add the chopped Vidalia onion and sauté until the onions are soft and glistening. Add the grated ginger and cook for one more minute. Add the marmalade and soy sauce. Stir and cook until the marmalade has melted and the mixture is combined. Taste for sweetness. Add honey as desired. Turn the heat down to low to keep warm. Spread 3 or 4 tablespoons of olive oil around the baking sheet, then arrange the asparagus on the sheet. Brush with the olive oil, then sprinkle on some coarse sea salt. Roast in the preheated oven for about 12 minutes, shaking the pan and turning the spears after 6 minutes. Remove from the oven and transfer to a serving plate. Pour the warm glaze on top and serve. Cut the asparagus into 2-inch chunks and stir-fry with the onions and ginger. Add the marmalade, soy sauce, and honey and cook until the sauce comes together. We usually have roasted asparagus with just s&p. Never thought to combine orange with asparagus. Neat combo! Thanks for the link to our shrimp and asparagus quinoa salad recipe! I LOVE the glaze Andrea! Seems kind sweet and sour. I loved the idea of adding marmalade to the glaze. love the combo of ginger and citrus. and love any veggie roasted. this “joint effort” sounds delish! We’ve been eating asparagus with everything. And roasted is my favorite. Your orange ginger sauce sounds divine. Happy Spring- and thanks for the shout-out! This is a very creative and new way to try roasted asparagus!!! I love it! The first time I tasted asparagus with orange was at a dinner of recipes from Julia Child’s Mastering the Art of French Cooking. It was paired with a provencal tuna main dish. What a perfect combination of flavors. What a great way to enjoy some asparagus! I’m so happy it’s asparagus season and now I have a new recipe to try. This looks divine. Thank you for also sharing it on Friday Foodie Fix. Enjoy our sunny weekend and warm weather! 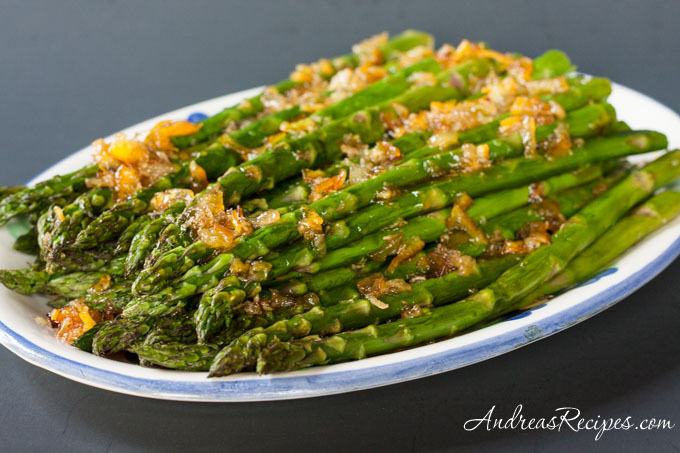 MMMMMMMM…those green asparagus with that dressing over the top sounds amazingly tasty! Love it! Do you think that I could use this also on the white asparagus? Because the white are more famous in Belgium! 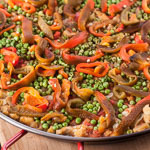 The flavor combinations sounds wonderful and the dish is visually delicious. This is a new asparagus recipe I’ll definitely try. Oh, I adore this flavor combination, Andrea, and the photos are really lovely. I’m posting a couple of asparagus recipes soon, and one includes oranges and honey, so I’ll link to this one too.